With more people using the 'net than ever, it's hard to get a single voice heard, but with the help of streaming video services, film studios are doing their best to give you exactly what you want. Recent years have seen the rapid downfall of the brick-and-mortar video rental store. In its place, online rental and video on demand services have sprung up, offering consumers instant access to almost any film ever made. Of course, since Hollywood has been churning out movies for over a century at this point, a number of those cinematic gems have seemingly vanished into the mists of time. The solution of course, lies on the 'net. "The Internet is invaluable in getting a very clear picture of what consumers want. We put out a film called The Cyclops, a small little horror movie with Lon Chaney Jr," said George Feltenstein, the vice president of Warner Bros. classic film catalogue. "We remastered it in hi-def, it looked great, but there were six seconds missing. We found out on Facebook, and within a week or two, we were able to find the original negative, get the footage that was missing, and send corrected copies to everyone who bought it. It's crucial that people know how important quality is to us." Likewise, the world's most beloved video rental service, Netflix, also relies on this kind of real-time buzz when deciding which films should join its video streaming service, Netflix Instant. "We're very scientific about it. If you're an independent filmmaker, and have contacted Netflix with your movie, we have to see that it's a seriously marketed film... You've entered it in film festivals, you have a website supporting it, there's critical buzz, one or any of these factors have to be available for us to add it to the site," said Netflix spokesman Steve Swasey. 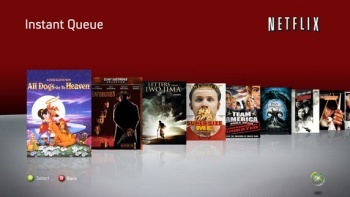 Netflix also relies heavily on the queue system that all its users should be intimately familiar with. Essentially, the queue is a list of films that you have requested be sent to you as soon as they are available. Not only does this prevent Netflix from running out of stock or overloading users with a glut of films, it also provides a useful gauge for which movies users may want to see on the streaming service. So useful in fact, that film companies themselves have even begun to ape the practice. Recently, Hollywood mainstay Columbia began offering its own films via on-demand video streaming, essentially by lifting the business model that Warner Bros. had lifted from Netflix. Feltenstein sees this as the inevitable future of entertainment. "It was the highest form of flattery. They took every aspect of our business plan, down to using the same replication company," Feltenstein claims. "What surprised me is it took them as long as they did. I thought by Christmas of last year, every studio would be in this business. If you're aggressive with your library, if you care about wanting to monetize it and please your shareholders by bringing incremental revenues to the company, it's a really good thing."